We continually receive sensory information about our environment and ourselves. Similar to human interactions, some sources of information are more credible than others. Thus, how does the central nervous system decide what source of information to listen to? What happens if the only available source of information is a distorted version of reality? These are important questions and the balance system is well suited to investigate them because it relies on a combination of somatosensory, visual and vestibular inputs (Pasma et al 2014). When distorted vestibular information is the only source of balance-related information, the central nervous system has no way of identifying these vestibular signals as gobbledygook and balance is severely impaired (Dakin et al 2010; Reynolds 2010). During a brief 2-day visit by Dr. Fitzpatrick to Vancouver, a crude system was built to test a basic idea: if a reliable source of information becomes available (e.g., opening the eyes), does the brain recalibrate the distorted vestibular input to the new veridical signal or does it rely more heavily on the new source of reliable information? Over the next two years, Dr. Jean-Sébastien Blouin, Tammy Law and I developed a sophisticated system to answer this question (see Figure 1 for details). 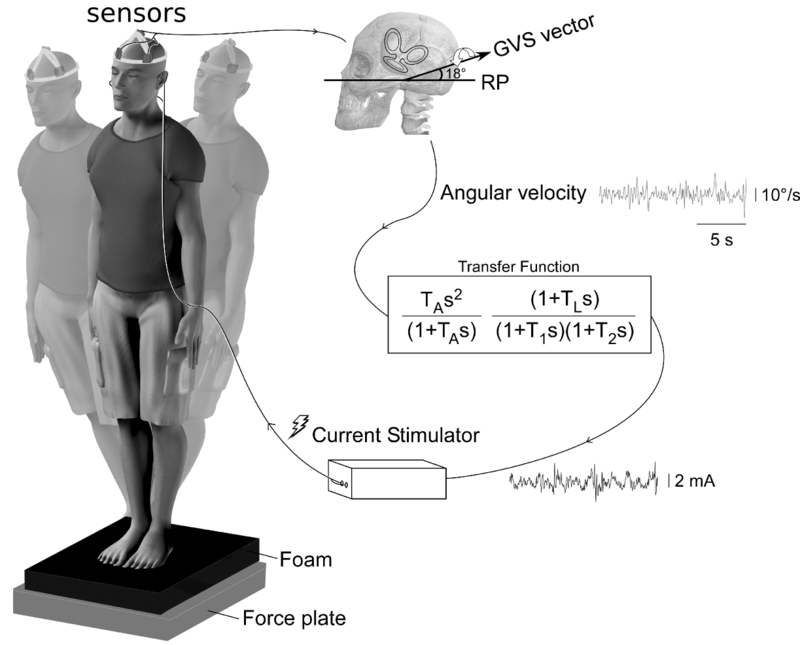 Sensors were used to measure moment-to-moment head velocity and control a galvanic vestibular stimulus so that vestibular inputs signalled the head was moving faster or slower than actual. As expected, vestibular stimulation caused a 4-fold increase in body sway when the eyes were closed and reliable somatosensory information was not available (standing on foam). However, the addition of reliable visual or somatosensory cues for a period of 240s resulted in subjects being able to stand normally on foam with their eyes closed (see Figure 2). An equivalent galvanic stimulus unrelated to sway or head motion was also destabilizing, but exposure to visual or somatosensory cues had no effect on the destabilizing nature of the stimulus. Figure 2. Example of large sway with galvanic vestibular stimulation (GVS) when eyes are closed (pre). After a period with the eyes open (240s), sway returned to baseline levels (control) when the subject closed their eyes (post) if the vestibular stimulation was coupled to head motion. In the present study, destabilizing vestibular signals became useful balance cues after the central nervous system was able to compare these signals to sources of reliable balance information. Also, balance and vestibular reflex responses indicated that the central nervous system likely recalibrated the altered signal of head motion rather that increase or decrease (i.e., re-weight) the importance of various balance related signals. These findings help understand how the brain adapts to acute changes in sensory inputs and clarify some pathological situations where abnormal vestibular signals have dramatic effects on balance compared with the situations of compensated loss of vestibular function. Héroux ME, Law TCY, Fitzpatrick CR, Blouin JS (2015). Cross-modal calibration of vestibular afference for human balance. PLOSone doi:10.1371/journal.pone.0124532 . Dakin CJ, Luu BL, van den Doel K, Inglis JT, Blouin JS (2010). 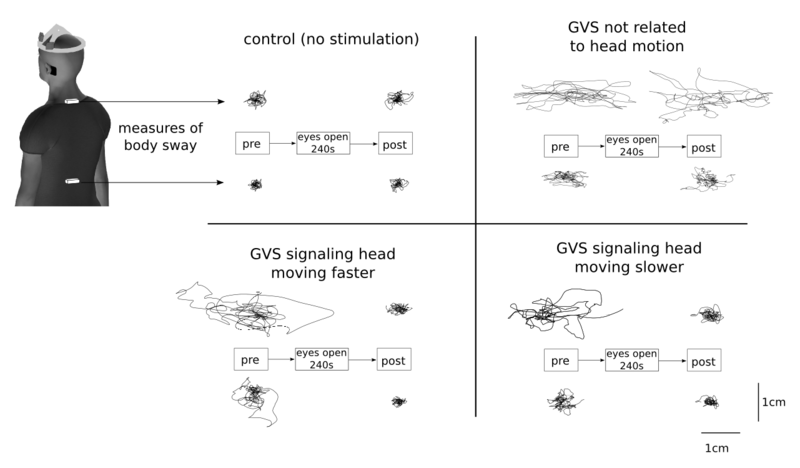 Frequency-specific modulation of vestibular-evoked sway responses in humans. J Neurophysiol 103:1048-56. Reynolds RF (2010). The effect of voluntary sway control on the early and late components of the vestibular-evoked postural response. Exp Brain Res 201:133-9. Pasma JH, Engelhart D, Schouten AC, van der Kooij H (2014). Impaired standing balance: the clinical need for closing the loop. Neurosci 267:157-65.